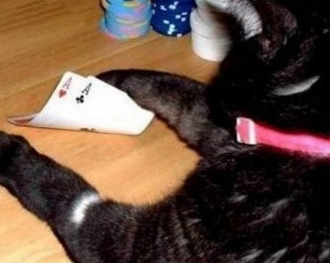 Though they are unquestionably irrational in origin, gambling superstitions are very common. Given that there is a very large part of luck involved in casting the dice or spinning the roulette wheel, if not maybe so much in playing cards which require a good share of decision making and judgment, it seems quite logical indeed that superstition plays a big role. As a result of this intelligent people often make wrong decisions based on these irrational beliefs. Here we try and illustrate the strongest held superstitions and cast a light on their origins in an attempt to put them to rest once and for all. This is a well known and very popular superstition which is not limited to the casino or to gambling. People cross their fingers when they hope for a certain outcome. The true origin of this superstition is lost in the mists of time but is generally attributed to our fears of witches. Back in the Middle Ages it was believed that we could ward off witches by making the sign of the cross. Paradoxically, it may also be an old pagan ritual which was performed to wish someone well as in, “I’ll keep my fingers crossed for you.” Either way this irrational belief has led to this current day superstition that lives on. Another interesting superstition that is prevalent but little understood is the act of blowing on dice or cards before playing. This can easily be verified at any craps table in any casino where you would be surprised how many people perform this ritual before throwing the dice. Although this seems like a relatively innocent superstition compared to a lot of the others that we mention on the website, there are two possible origins to this peculiar habit. The most interesting possibility goes back to the early days of gambling when gamblers would try to cheat by coating one side of the dice with a sticky substance that would become active when blown on. Other historians believe that this superstition originates from earlier street games and was simply a method for cleaning the dice before throwing them. Read about the other popular superstitions in the following article.